Gluts glorious gluts.. | La Rosilla - Lifestyle and food. It was a slow start to the vegetable harvest this year’ but eventually nature got going and we have enjoyed a mountain of wonderful fruits and veggies that we are still picking daily as and when we need them, fresh green beans, courgettes, tomatoes and herbs to pep up all kinds of dishes. The star crop this years has been our Aubergines, which we devour guilty as ‘Berenjenas fritas’ a light battered aubergine slice, drizzled with cane honey, DELISH. Roasted and whizzed into Baba ganoush, chopped and braised for caponata, but a new dish I’ve created is a mixture of two our our family household favourites, with a few changes here and there, to make it a little healthier on the waistband . Mousakka and Lasangne turns into LaRosaka *spin on La Rosilla, get it !! In a large pan sauté the carrots, onions and garlic until softened not browned. Add mince and stir well until browned. Add Toms, stock and wine, bring up to boil and simmer gently, add lots of salt and freshly ground black pepper. 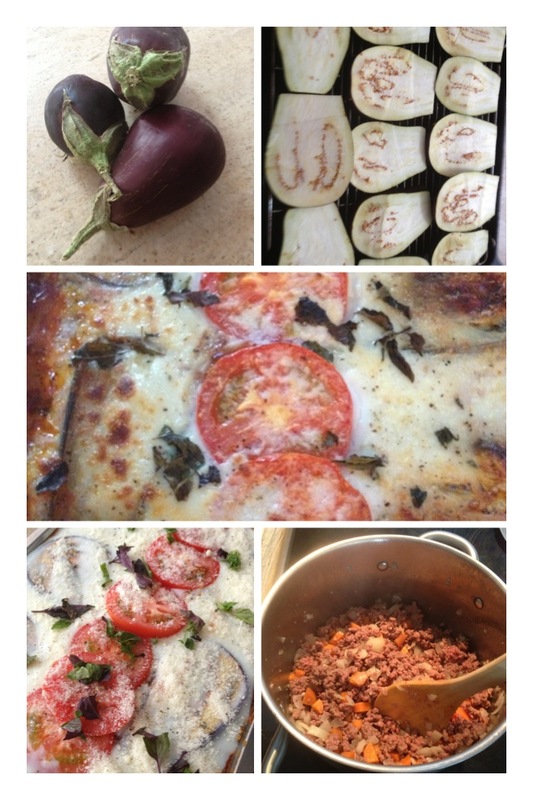 Place the sliced aubergines on a grill pan and spray with olive oil, grill until browned on both sides about 5 mins. Put milk, bay leaf and onion in saucepan and simmer gently, for 5 mins then take off heat to let flavours infuse. Mix cornflour with milk until dissolved. Remove bay leaf and onion from milk in pan and add cornflour mix, heat gently until sauce thickens. In a large baking dish, put a layer of meat mix, then a layer of aubergines, season and add some more dried oregano, now a layer of white sauce…Repeat. Finishing with a layer of white sauce. Layer the sliced tomato on top of the white sauce, then sprinkle the whole dish with parmesan. Bake in a hot oven for 30 mins, until bubbling and golden. Serve with green salad, or fresh beans and hot crusty bread to mop up the sauce. You could add, courgettes and peppers to your sauce too, and celery with you carrotts at the beginning..just experiment.